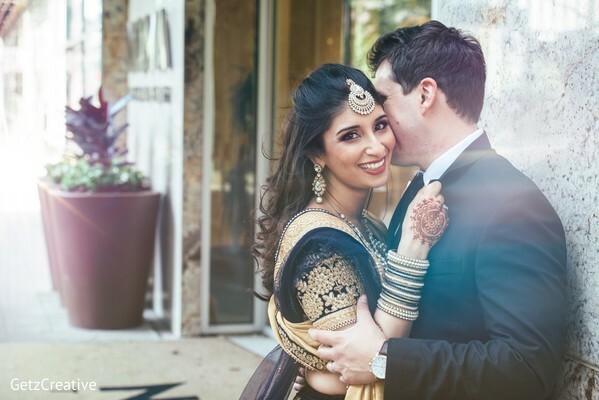 When we learned that our Maharani was a “Type A” person, who insisted being on top of everything, we knew that Gini and Peter’s nuptial bash would be a culmination of her efforts, and we couldn’t be more right! 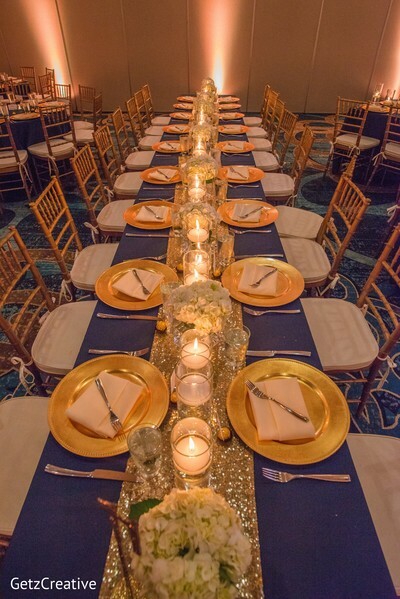 Their reception at Hyatt Regency Greenville, planned by Crystal Williams Events glittered in gold, with touches of navy blue, and soft, dimmed red lighting by DJ Anis of Prime DJs. 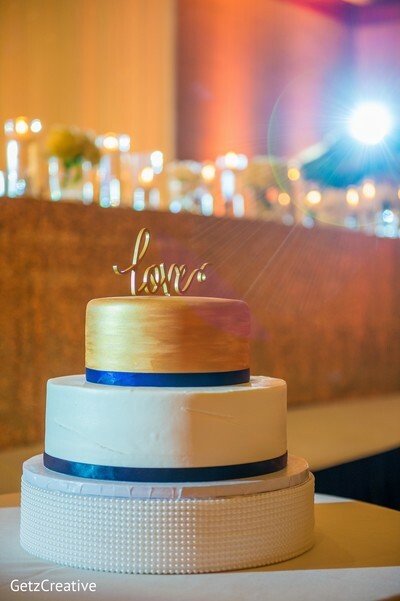 Navy and gold made for an ideal wedding palette given Gini and Peter’s elegant taste. 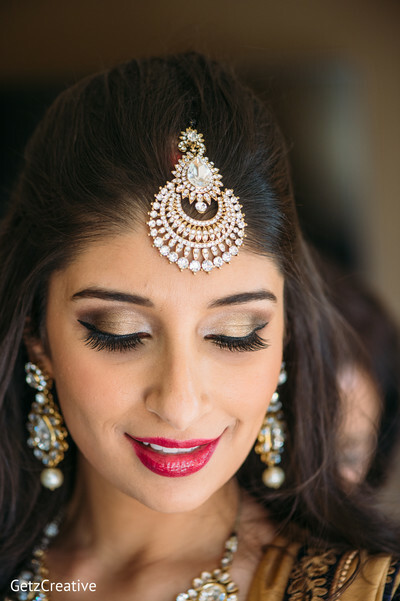 Gini matched her outfit to the overall color scheme and opted for an ornate navy and gold lehenga, which she accentuated with a stunning Chand Bali maang tikka, and matching pearl bangles. Loved the pop of pink in her look that came via her lipstick, and Cotton Rouge styled her hair in relaxed, long beach waves. 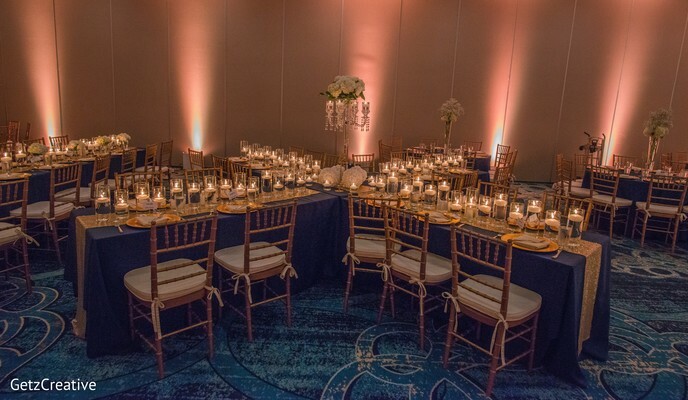 Long tablescapes and crisscross tables for the families added a nice dimension to the ballroom, and the crystal and gold centerpieces were a perfect contrast to the navy linens. The Bakery Off Augusta baked a quintessential white wedding cake that incorporated the decor scheme through the ribbons on each tier. 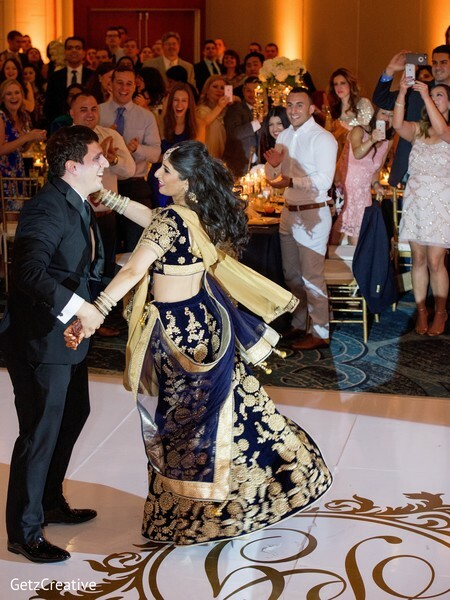 Gina shared a fun snippet with us about their reception dance - “When I was in India, I reached out to the Delhi Dance Academy and Chow En Lei choreographed a cool fusion dance for us. We walked out into our reception and went straight into the dance. The crowd loved it!” Equally impressive was the beats by DJ Anis of Prime DJs who kept the dance floor packed all night. Getz Creative Photography gave us some amazing shots of the reception that you can take a closer look at by visiting the gallery! We met at a local sports bar in Long Branch, NJ when Peter "accidentally" stepped on my foot. He flashed a smile and bought me an apology drink; and with his two left feet, he's been stepping on my toes ever since! I knew Peter was "the one" when I told him that the Game of Thrones opening song always made me a little depressed. The next time we watched Game of Thrones' opening song he did an impromptu interpretative dance in front of the TV and it was hysterical. That's when I knew that this was man who would do anything to make me smile. I still can't watch the Game of Thrones opening song without laughing at the image of Peter interpretative dancing. Peter proposed to me on a Friday evening when I came home from work, with candles and roses! I had a feeling he was going to propose because he was nervous all day. We had a nice quiet night in, called our friends and family, and I expected the story to end there. The next day he suggested we go to a nice restaurant in DC to celebrate. I walked in to the restaurant, turned the corner and saw my whole family (flying in from CA and SC) and Peter's family (coming in from NJ)! He totally surprised me and I had no idea they would all be there! That was the first time the families met, and it was a great evening! 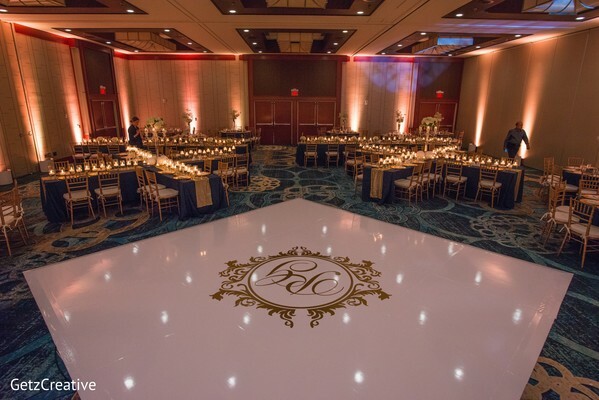 Tell us how you went about planning your wedding, and your overall experience the Venues, Hair & Makeup, Outfits, Decor Theme, and all of the other important details. I'm a Type A person and an engineer, so I knew I wanted everything done in the most efficient/cost-effective way! I had extremely detailed spreadsheets and timelines to make sure the big day went as smooth as possible! Picking the right venue was one of the most important choices, as about 70% of our guests were coming from out of town. We picked The Hyatt Regency Greenville that afforded our guests lots of activities and eating options. It was a well known-venue, so it also made it easy for many of our vendors who had worked there. All of our vendors, from Cotton Rouge to Getz Creative Photography and Aayojan, were extremely professional and worked with my Type A timeline! One of the biggest tasks I undertook in the whole wedding planning was getting outfits for everyone in my family and my husband's family (totaling 10 people) and our 14 bridesmaids and groomsmen from India! I spent 3 weeks in Delhi custom designing my family's wedding outfits and bridesmaids and groomsmen outfits, in addition to printing custom wedding invitiations, getting custom made pagdis, and even buying horse dectorations! In the end the devil was in the details! Thanks to my intensive spreadsheets I ended up bringing home over 55 outfits, and didn't miss a single person! Hope you enjoyed these fun insights into the #arealginiwedding! 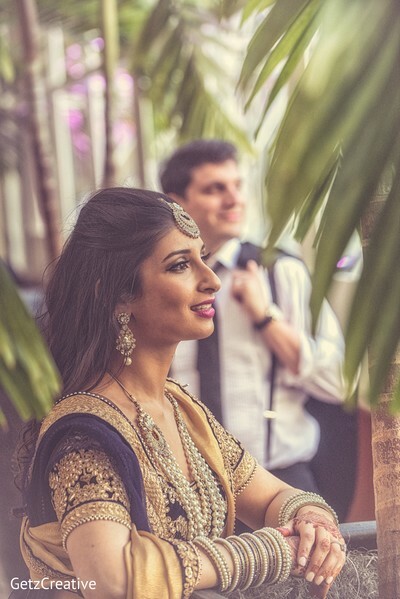 Come back for more such fun and awesome weddings right here on Maharani Weddings!